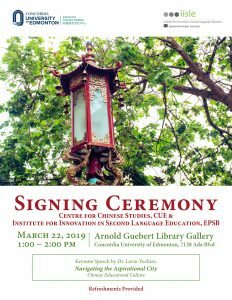 You are cordially invited to join us at the Ceremony for the Signing of the MOU between the Centre for Chinese Studies, CUE and the Institute for Innovation in Second Language Education, EPSB. The short ceremony will be followed by a keynote speech by Dr. Lorin Yochim on his newly published book –Navigating the Aspirational City. Many of the language consultants from IISLE, EPSB and some of EPSB’s principals from the Chinese program schools will join us at the ceremony and presentation. Please feel free to stop by and learn more about IISLE and language programs at EPSB.